Recognize the great value of this program? Share it with your friends & colleagues and get paid for it! Become a Moore Master Coaching affiliate. Sign up is quick and easy and you'll get 10% commission on all future purchases from your referral. Click here to sign up to become an affiliate. Facebook & Social Media Groups etc. Of course feel free to personalize and add pertinent details for specific calls if youd like. 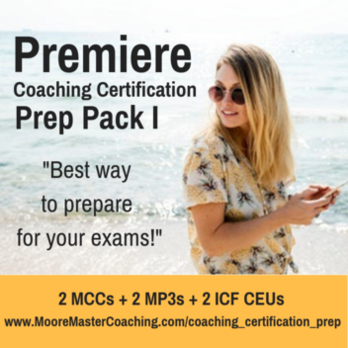 Moore Master Coaching is the place to hear live Master coaching, real world sessions & get CEU's! Complete the form below to receive an email with the link to the free "guided" preview call and notes. I give Moore Master Coaching permission to send me the occasional email. Can unsubscribe anytime with simple click. MMC respects your privacy, this information will never be sold, traded or abused. To see all upcoming Master Coaches visit home page and scroll down toward the bottom of the page. Read all about the Prep Pack! Visit "Inside the World of Master Coaches" on Facebook. And please "like" the page! If you signed up for the free preview call there's no need to sign up here as well as you will be on the mailing list! I give Moore Master Coaching permission to send me email about new products, services and special offers. "Inside the World of Master Coaching"